Old School Bell at the top of the marker. 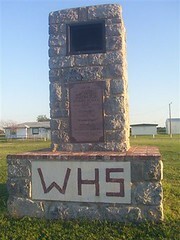 Location: From Fort Cobb, Ok, Caddo County, on Ok 9 go 7 miles east to intersection of of OK 9/US 62/ US 281 continue of 2 miles east on Ok 9 to sign that read Historical marker 4 miles turn left go to stop sign-jog in road straight head to - stop sign at Washita, Ok (don't give up it's there I turned around once and then turned around again and decide I'd keep trying) turn left about 1/2 miles. Marker is in grassy area on the right. Take the first road at in of the grass turn right and it will take you around to the front of the marker on north side. 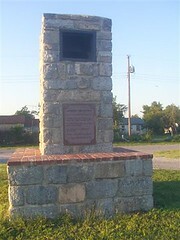 Marker is on right side.